By Chris Williams: Top Rank promoter Bob Arum has decided on staging the April 20th Terence Crawford vs. Amir Khan fight at Madison Square Garden in New York, according to Talksport. The fight will be announced this Tuesday in a news conference in London, England. The hope is that Khan’s loyal followers from the UK will make the long trip over to New York to see him fight World Boxing Organization welterweight champion Crawford (34-0, 25 KOs) on April 20. Arum’s decision to stage the Crawford-Khan fight in New York rather than Las Vegas, Nevada will make it slightly easier for Khan’s British fans to make the long journey over to the States to see him fight. Las Vegas is roughly 5,000 miles from England; whereas New York is only 3,400 miles. New York is a little bit closer journey for the UK fans than if the Crawford vs. Khan fight were to be staged in Vegas. Arum went on to point out that Saul Canelo Alvarez and Vasyl Lomachenko’s recent fights in New York sold out at Madison Square Garden. Arum believes that the Crawford-Khan fight will sellout with it being staged in New York rather than Las Vegas. That remains to be seen though. Arum might need to put some of his East Coast fighters on the Crawford vs. Khan undercard to ensure that it sells out, because Crawford and Khan are not big names in that part of the U.S. Lomachenko selling out MSG in New York makes sense, because that’s where his fan base is at. Canelo is popular nation wide, so it’s not surprising that his fight with Rocky Fielding sold out. Crawford vs. Khan might not sellout in a similar fashion without Arum loading up the undercard with East Coast fighters that people that area of the U.S are familiar with. 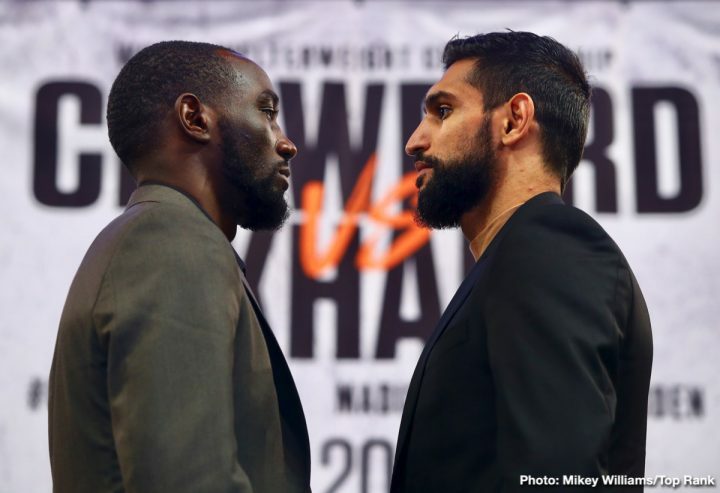 For the casual boxing fans in the New York area, they’re not familiar with Crawford and Khan. The only East Coast fighter on the Crawford-Khan card right now is unbeaten lightweight contender Teofimo Lopez (11-0, 9 KOs), who is from Brooklyn, New York, and now lives in Las Vegas. Arum confirmed that Lopez will definitely be on the Crawford-Khan undercard. It won’t be surprising if Lopez winds up in the co-feature bout, as long as he doesn’t suffer an injury in his next fight against Diego Magdaleno on February in Frisco, Texas. It’s still unknown at this point whether the Crawford vs. Khan fight will be televised on Sky Box office or not. The problem is that if IBF/WBA/WBO heavyweight champion Anthony Joshua fights on April 13 on Sky Box Office, then Matchroom Boxing promoter Eddie Hearn won’t want to put Crawford-Khan on PPV as well, as it would be two PPV fights in a row on Sky and that’s asking a lot of the UK boxing fans.